After a rocky start, wood nymph Laurel and bear-shifter Aiden have made a happy home together in Nocturne Falls. Sure, Laurel is still getting over the trauma of being stalked and almost killed by an old boyfriend, and Aiden keeps having nightmares about his time as an NYPD Detective, but overall, they have a calm, peaceful life. Until their relatives enter the picture. Before they know it, they’re on a road trip to Nashville – accompanied by Laurel’s sister, Aurora, and Aiden’s buddy, Wade – in order to prove that Aiden’s country music superstar father – who he didn’t even know was his father – didn’t commit the crime he’s being accused of. All Aiden and Laurel want is time alone together, but that’s not happening anytime soon. Can they save Aiden’s father and wrangle everyone else into shape before they lose their minds? Or could all the family drama push them over the edge? 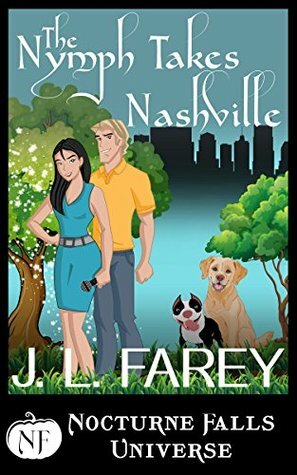 The Nymph Takes Nashville is the sequel to J.L. Carey’s first story to the Nocturne Falls Universe. I enjoyed getting to read more of Laurel and Aiden together, especially after what they dealt with in the first story. Laurel is still dealing with what happened to her in the first book. Poor Laurel! (I won’t go into the details of it, especially if readers haven’t read the first book yet from J.L. Farey) There’s also Aiden still dealing with his nightmares that I wish I could find out more about. I have a feeling the author will eventually tell us because she left me hanging with it not mentioning The End, but is it really the end for these two. I don’t think so because there’s still so much to learn about these two. The sequel introduces us to some relatives of Laurel and Aiden and that is when drama happens in the story. Aiden’s father in Nashville has been accused of murder, but first let’s just mention that Aiden never knew who is father was. This is going to be an interesting introduction to father and son in the story. Hi son, I’ve been accused of murder, but I’m so glad I finally got meet you. Yup…very interesting indeed. There’s also the fact that Bailey, the talking dog now has a back story on why he started talking. I’m so happy to know that he ended up with Laurel after getting to know his back story. This book includes a lot of family drama, a little bit of mystery, and some cuteness with the two adorable main characters. I loved the ending with these two since they are definitely my favorite of the Nocturne Falls Universe. A bear shifter and nymph…just adorable together. I give this book 4.5 stars and highly recommend it to readers of PNR, fans of the Nocturne Falls books, and fans of J.L. Farey.